Display counter is a necessity for any modern business that strives to offer the best quality, fresh items to the clients. It helps you display your favourite food and store them at proper serving temperature. 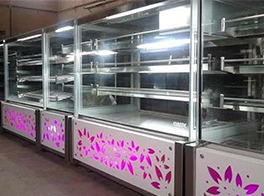 Whether you have a sweet shop or a bakery, you can have a display counter to display your items and attract the attention of the customers towards your delicacies.